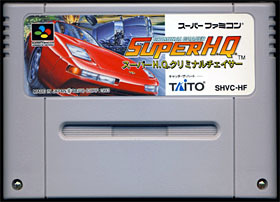 Super HQ is an action/racing game by Taito and is an 'enhanced' version of their own arcade game originally released in 1988. The player takes the role of an undercover police officer who must pursue dangerous criminals and fugitives in high-speed car chases. The police vehicle must drive towards the fleeing criminals and stop them before they get away, avoiding not only passing traffic but also obstacles such as barricades or outlaw bikers who love to throw Molotov cocktails (or frantically shoot bullets at the car's windshield). The police cruiser comes equipped with three nitro-boosts that allow the player to attain maximum speed for a short amount of time. Furthermore, the player must always keep an eye on his damage indicator, every hit drains it down and final encounters with the criminals will most certainly put a serious dent in it as they don't usually hesitate to shoot bullets or to fire deadly missiles are the police cruiser. The game ends when the damage bar is depleted or when the time limit runs out. 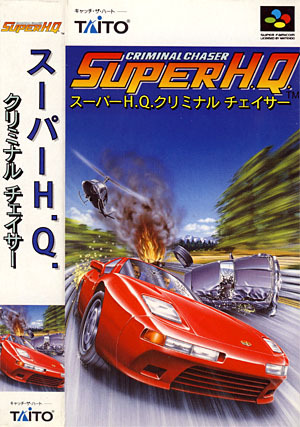 Super H.Q is more a spiritual sequel to Chase H.Q and is based on the third episode in the series, namely Super Chase: Criminal Termination. Both games share a lot in common, such as the first person perspective.